Once you have your hands on an active mother, you can experiment with all the flavors available to you. The vinegar making process is extremely tolerant and it turns out alright without too much fuss. Out of laziness, I don't measure and tend to mix more by taste as I vary the ingredients depending on how intense I want the vinegar to turn out. Sometimes I will make a batch as small as a jam jar mostly to experiment with intensity. 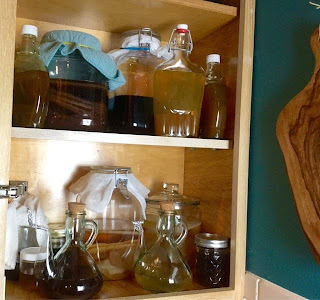 There exists a myriad ways of making vinegar but I tend to make micro-batches with high-end ingredients and the instructions below reflect just a rough guideline on how to make such a recipe. Flavor base like a sweet syrup - You can start with raw fruits like pineapple or apple but I tend to favor fruit syrups (i.e. Elderberry Syrup/Lingonberry Syrup) as the base as the resulting vinegars come out more intense. The sugars have to convert to alcohol and then to vinegar. Liquor - Since I'm going for quality, I tend to use specialized liquors like Elderberry Liquor or Creme de Cassis but you can also use cheap amaretto and rum with good results. 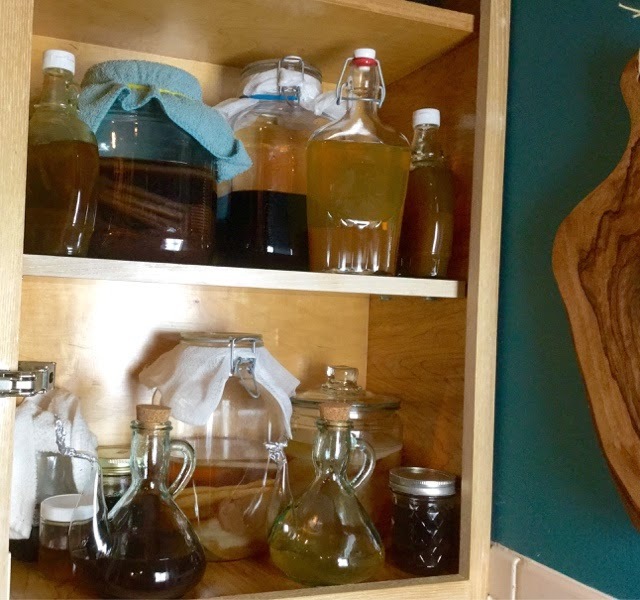 Water - I use anywhere between 1-1 to 2-1 water to syrup ratio. Some berry syrups can become too bitter at full strength. Mother -You can put a tiny square inch of mother, a spoonful of gunk, or sheets of it which will greatly accelerate the conversion. I place the cloth covered jars on a dark shelf and forget about it for a month or sometimes 3 months. Don't forget to have a secure rubber band around the mouth of the jar as a fruit fly infestation is one of the annoying things that could happen to your vinegar. After about a month, you can see a thin translucent layer of mother forming. You can also taste it time to time to see how it transforms. Sometimes I'll use the vinegar in it's lightly fermented state. Carob Syrup + Rum - cracking with with persimmon salad. Apricot + Amaretto - boxed Apricot Juice + cheap Trader Joe's Amaretto.